What are the benefits of orthopedic dog beds? 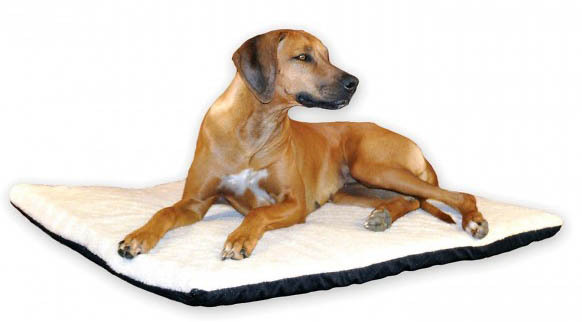 An orthopedic or memory foam dog bed is a premium alternative to regular dog beds. Their benefits are numerous, and this makes them ideal for dogs who need the extra support that a normal bed can’t provide. There are lots of options out there though and if you’re looking at buying this sort of bed or mattress for your dog, you might feel a little overwhelmed. Which is the right one? Check out my big guide below which will hopefully make your choice easier – as well as provide you with information about what makes orthopedic beds for dogs so good! Regular dog beds or pillows can be comfortable, but a memory foam type bed or mattress has a whole other level of benefits that all dogs can enjoy – no matter what their age or health is like. With that said, there are certainly some dogs in certain situations that get great benefit from an orthopedic bed, particularly aging dogs and those with painful health conditions. Does that mean a young, healthy dog shouldn’t bother with an orthopedic bed? Not a chance; they certainly love them as well! This thick memory foam bed (varies with size, but the Large and X-Large are 7″ thick) is another design fitted with a headrest pillow, giving it a more bed-like appearance than the flat mattresses. Compared with the Big Barker bed, the headrest on the Kopeks is somewhat thinner and less substantial in width, although it is a generous 3″ high. In this regard, the Big Barker offers greater head support for most dogs. Keep in mind that not all dogs will choose to rest their head on the pillow all of the time, so for many people this is not a make-or-break feature. 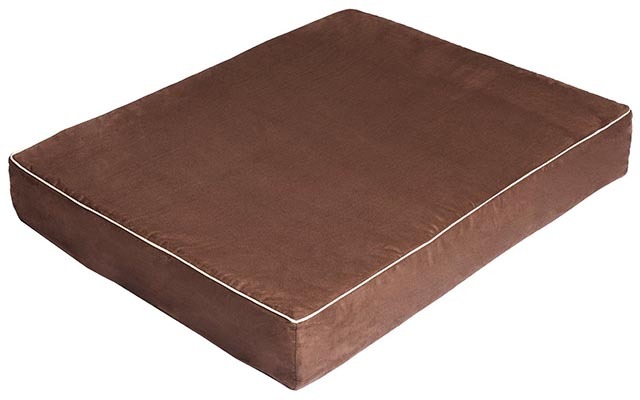 But there many positive points to touch on about this Kopeks memory foam dog bed. The thickness of the entire mattress, for example, puts it up there at one of the most luxurious available. The Extra Large sized bed has a 7″ thickness, which is the maximum height that it also shares with a couple of the other beds detailed in this guide. The bed comes shipped in a more flattened pack and the company makes it clear that it can take a few weeks for the mattress to naturally expand to its full thickness. So there is absolutely nothing wrong with the mattress if it looks a little shorter than you expected – it just requires a little patience until it “grows” out over this short period of time. Once it’s at its full thickness, it remains that way. 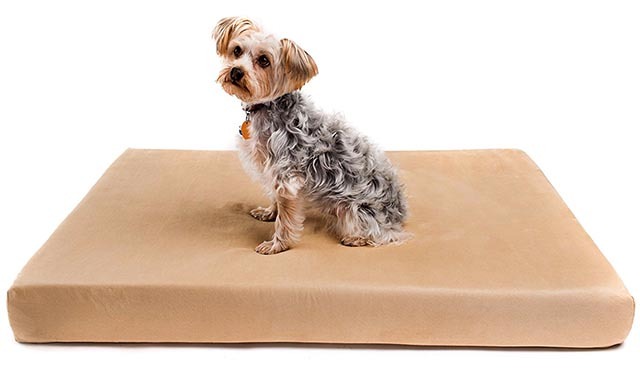 Like many of the other top quality orthopedic dog beds featured in this article, the Kopeks beds use high quality hypo-allergenic memory foam of a similar standard found in some of the best mattresses for people. The memory foam mattress takes up the entire thickness of the Kopeks bed, rather than there being a thinner layer of memory foam on top of a standard foam base mattress as can be seen in some other products here. That’s a big positive point for the Kopeks range as it gives a dog 100% memory foam all the way through the mattress. One of the problems that pops up with some dog beds is a strange smell which often occurs when low quality materials are used, and can indicate potentially harmful chemicals. However the Kopeks bed has no such issues because of the high quality materials used so this is not something a buyer of this bed will need to worry about. You can choose from the headrest style shown above, or there’s another option from Kopeks: the sofa style memory foam bed. It contains the same 100% memory foam mattress design and waterproof cover. 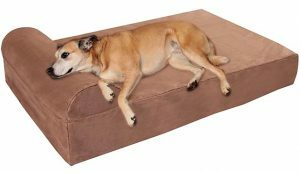 It looks like a plain bed at first glance, but the bare bones exterior hides a luxury memory foam dog bed that is made for dogs who suffer with arthritis and and other painful conditions. Or just for those who want to rest in absolute comfort. There are 2 support layers in this bed: a thick base, and on top of that is a one inch memory foam mattress made of what the company calls their highest quality premium memory foam. The cover is made of soft micro-suede and is easily taken on and off with a zipper for easy washing, as is the waterproof lining. This provides excellent protection for the mattress underneath. The underside is slip-proof. At about 4 inches in total height, the Romilton bed is designed to provide full support and not result in the dog sinking down on to the hard floor. This means the full benefits of memory foam support are had, which can be a problem with low quality beds where the foam is not supportive enough to provide any orthopedic benefits. How much waterproof ability does the lining provide? This is a common question that people have for any orthopedic bed and is a particular issue if you have a dog with imperfect bladder control or who is not perfectly trained. The Charlie bed is as waterproof as they come. That’s to say, it won’t repel a soaking (as any other bed wouldn’t), but a trickle should not get through to the under mattress surface. This gives you enough time to completely wash the cover, without any damage occurring to the memory foam or the underlying thick mattress. They don’t come much bigger than this. 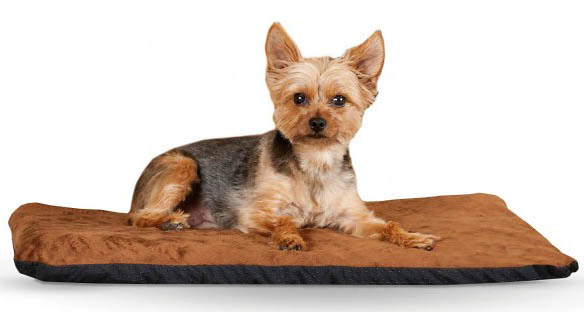 It’s not called the Big Barker for nothing – this orthopedic bed is made for large dogs. There are three sizes, and small isn’t one of them. Large, Extra large and Giant are what you have to choose from. All are a very generous 7 inches thick, giving more than enough support for the heaviest dogs. The inbuilt headrest makes this more of a very comfortable bed rather than just a mattress. The higher price of this bed might make you think twice; but consider that the company provides a guarantee that the bed will not flatten or “pancake” or lose any more than 10% of its original shape and height within 10 years. No other bed comes with a guarantee like this, so it’s something to keep in mind. The pillow section of the Big Barker is one of, if not the most comfortable one I’ve seen. It’s nice and wide, comfortably curved, and just the right height so it provides good neck support without having the dog in an uncomfortable position. This is a bed for those who want top quality for a large dog, with no compromises made on comfort, support and a guarantee that this orthopedic bed will keep its shape for at least a decade. The Dog’s Bed comes in Small, Medium, Large and Extra Large. So it can be used by any breed of dog and many smaller dogs enjoy a larger bed, as do two dogs sharing the one bed. 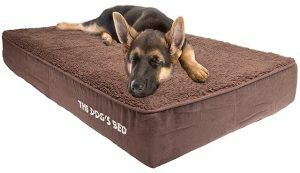 The Small size is well suited to puppies and the smallest breeds, while the larger beds are designed to handle the weight of bigger dogs so that they are receiving all the orthopedic support they need and all the benefits of memory foam. The thickness of the Small and Medium sized beds are 4″ high, while the Large and Extra large both stand at 6″ in height, making them some of the thickest orthopedic options available. The memory foam is medical grade, and the soft cover and waterproof inner layer are easily removed for washing. You can also buy replacement covers if you prefer to have a spare on hand. This is by no means a soft bed. It’s made to be firm, and some people note that it feels too firm for their liking (but I prefer to know the dog’s opinion!). If you find that The Dog’s Bed is indeed a little too firm for your dog, you can place a thin softer pillow or padded bed on top and still have most of the orthopedic benefits of the mattress underneath. The firmness of The Dog’s Bed is for a reason – to provide the extra support for dogs who need it, and to ensure that the bed retains its shape and stability over the long term. The large and X-large size of The Dog’s Bed are 6″ high, making them one of the thickest orthopedic dog beds available. A simple, flat rectangular design. The Arf Pets bed for dogs is thick and solid and is well suited to bigger, heavier dogs. 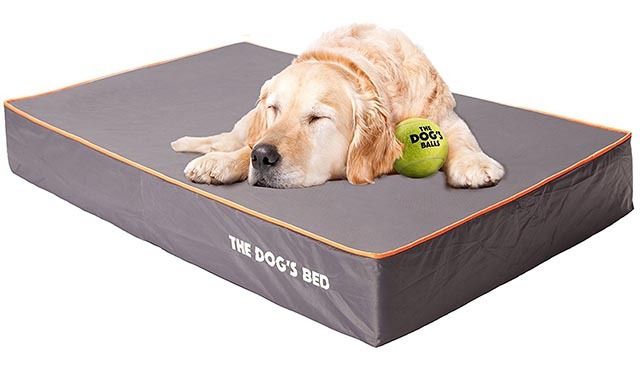 Both the Large and Extra Large sizes have a 5.5 inch thick mattress, and the firmness stops the dog sinking to the ground. Instead, the memory foam is able to contour around your dog’s body so he is well supported. This makes it ideal for arthritis dogs, the elderly, and those with joint or hip conditions. But even the healthiest of dogs will enjoy the increased support that this mattress offers compared with a regular dog bed. This is the only orthopedic bed reviewed here that is double sided. It’s been designed to have a special layer on each side that provides benefits in either winter or summer, so you can flip it over with the seasons. For the warmer months there’s a special gel memory foam layer that helps maintain a more comfortable temperature on hot days and nights. In winter, you flip it over and your dog lays on the egg carton shaped upper layer that acts as warming insulation. In between these two layers is the thick reflex support foam which provides the main stability, height and structure of the bed. 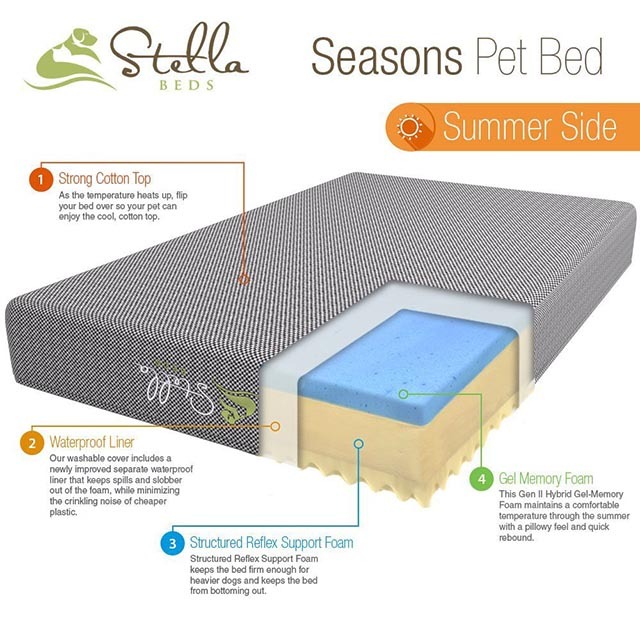 The “summer side” of the Stella bed provides a cooling effect, and in winter you can turn it over for increased warmth. Serta makes several styles of orthopedic dog beds ranging from plush couches to comfortable crate mats. Their flat mattress, called the Quilted Couch, is 4″ in thickness, so it’s not one of the thickest beds in the line up but it’s been designed to be extremely supportive and provide full orthopedic benefits. It’s a bed that would suit small to medium weighted dogs up to around 90 pounds. 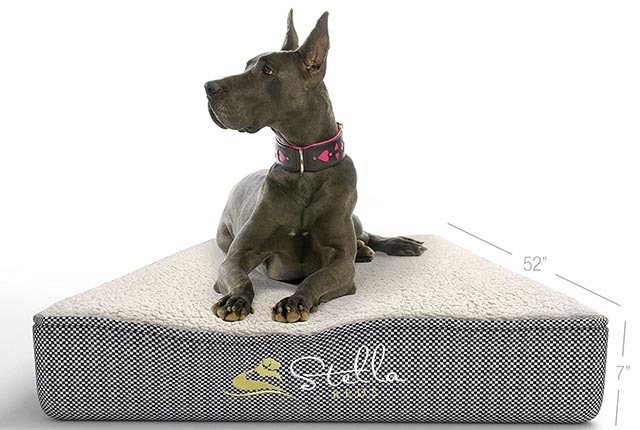 This is a really popular and well received mattress with many benefits, so don’t look past it based purely on the fact it’s not as thick as the 7″ beds (unless you have a much heavier dog, in which case you will indeed want a thicker bed that supports the full weight without sinking to the floor). It uses quality therapeutic foam and the zip on cover (which comes in 3 colors) is easily taken off, washed, and replaced. The mattress is made up of a combination of a crate foam layer on one side, with a more solid foam on the other half. This provides a good balance of orthopedic support as well as overall support for the mat, so it can withstand the weight of most dogs. From plain no frills mattresses, to heated beds – there are multiple types of orthopedic beds for dogs. The one you choose will depend on what features are important for you and whether your dog has a specific health condition that can benefit from certain features. With that in mind, even beds with the most luxurious features provide immense benefits for even the youngest and healthiest of dogs. It simply comes down to how much you want to spoil your pal. A heated orthopedic bed provides a dog with double the comfort: the benefits of an orthopedic base and the extra warmth that is so beneficial for conditions like arthritis. There aren’t a lot of orthopedic dog beds with built in heating but the ones that do exist are of excellent quality. They are designed to automatically warm up the bed to a suitable temperature for your dog once he lays on it. This provides a much more automated way of working compared with using a simple heating pad. It also lets your dog enjoy the full comfort of the orthopedic bed without any obstruction, since the heating mechanism is part of the design. Note that any dog that is not mobile enough to remove themself from a heated bed should only use one under supervision. The K&H Ortho Thermo Bed is one of the very few orthopedic heated dog beds available. When you want to wash the bed, you can easily remove the cover (made of fake lambskin) and heater. And during the warmer months of the year, you can remove the heating part completely so your dog is left with a cool and comfortable ortho bed. This bed will suit any size dogs. Smaller dogs will enjoy the extra space, while the extra large size caters to the biggest of breeds (or multiple dogs snuggling together). This bed is powered by electricity, so you’ll need to have it plugged in (the cord is 4 foot long). Obviously, this means the bed isn’t suitable for dogs that are known to be avid chewers of cables unless you have a chew-proof cable protector. The warmth is activated by plugging it into the power outlet and switching it on – there is no on/off switch on the bed itself. Only a very small amount of power is used (13 watts), so leaving it plugged uses very little electricity. The heating is controlled by an internal thermostat in the bed. The heat of the bed can barely be felt until your dog sits or lays on it, applying pressure, and this is when the full comfort of the heating is felt. This allows the dog to feel just the right amount of warmth for his or her weight. The maximum heat that the bed generates is up to 102F degrees, which is considered the normal body temperature for a dog. For washing, the internal warming heater is easily removed, then you simply take off the soft cover to wash. The bed itself consists of double layers of orthopedic foam which are thick enough to support dogs of any size. The bottom of the bed is non-slip, so dogs who love to dive on to bed won’t be sliding it around the room. Heated bed mats should not be used in a crate. Even though good quality heated beds are designed to provide a safe level of warmth, any risk of your dog overheating and not being able to voluntarily remove themself from the bed needs to be avoided. A dog memory foam crate mat increases the comfort in a crate substantially, and this can make it easier to train your dog to use the crate with less anxiety. The more pleasant you make the experience, the more likely he is obviously going to want to participate. Most people choose a memory foam mats for crates and kennels that’s not as thick as the highest beds you’ll see here, which are in the 5″-6″ in height range. Instead, a thinner yet still supportive bed like the Simmons Beautyrest is a great option for using in dog kennels and crates. 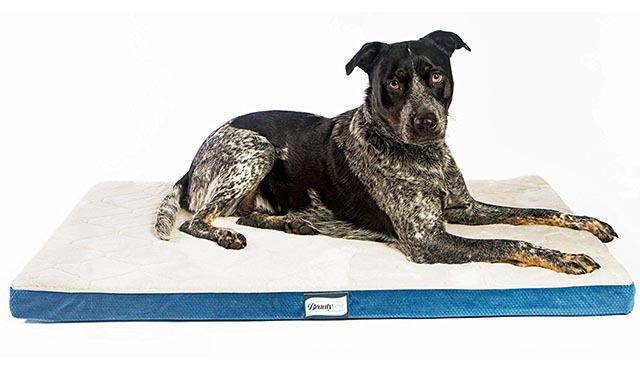 All three sizes measure only 2″ thick, but consists of both a memory foam mattress and a supportive foam pad that still provides support for joints and muscles, without taking up excessive room in a crate or a kennel. A comfortable mattress like this, placed in a crate, has helped people to make considerable progress with training their dogs to use a crate – many find that their dog suddenly loves using the crate thanks to the comfy bed inside. This sort of compact dog mattress is also a good choice for travel cages. Most of the beds described in this guide are fitted with a waterproof lining. This doesn’t make them 100% resistent to a drenching. But it does protect the valuable mattress or memory foam layer from dampness if your dog has an accident or if some water spillage occurs. 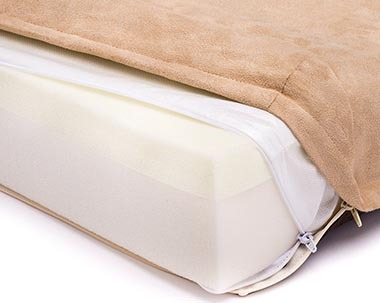 A good orthopedic bed will have a removable waterproof cover that’s easily washed. 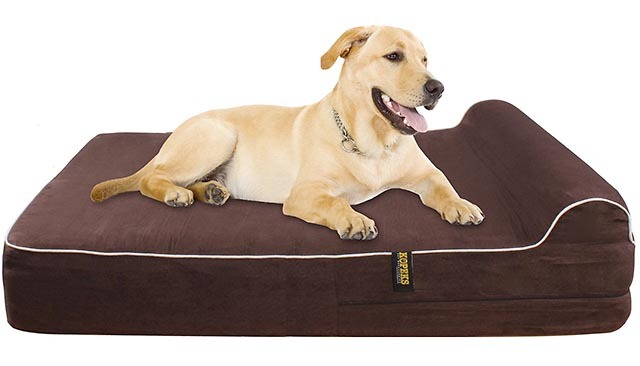 Additionally, the best brands will have available indviidual waterproof orthopedic dog bed covers that you can buy seperately, which cna be a good way to keep a spare on hand so you have a replacement when the other one is being washed. 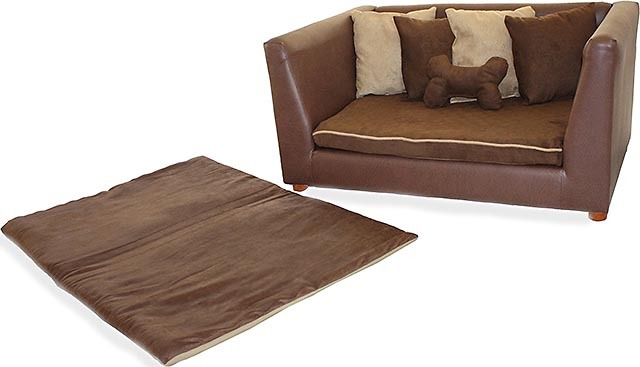 A soft style orthopedic dog lounge is no doubt the most luxurious design. What self respecting dog doesn’t want his own dedicated sofa to lay on? Not just any sofa though; an orthopedic one with all the added comforts and health benefits of memory foam. The cover is a soft suede material, making it very gentle and comfortable. The cover secures to the sofa with a zipper and the underside is made of a textured rubber surface, so the lounge won’t slide around. Underneath this is a waterproof lining which helps protect the mattress against moderate dampness. It also adds a hygiene factor. This is something you rarely find in other cheaper orthopedic beds. The mattress itself is very thick. The large size lounge has a 5″ thick mattress which raises to 7″ around three sides that act as a comfy headrest. It consists of high grade, hypo-allergenic orthopedic memory foam of a similar type used in human products, for maximum support and comfort across the entire sofa. This is covered with the waterproof lining and zippered suede cover. If you do happen to need a replacement cover, or just want a spare one so you can have one to put straight on when the other is in the wash, the covers are available for separate purchase. You’d be forgiven for thinking this is a piece of furniture for people. This grand looking sofa lounge is perfect for those who want their dog’s accessories to blend right in with the home decor. The lounge is made of a real wooden frame covered in durable artificial leather upholstery with a quality foam underlay for extra padding. Your dog might not care too much about how fancy it all looks. But she will want to know if it’s comfortable. Is this something that most dogs will want to sit, lay and sleep on? One of the first things you’ll notice when trying to select a good bed is that some of them are very thick, while others are quite thin. Yet they all claim to be able to provide the same orthopedic comforts. Are the thicker beds really better? There is no doubt that the thick mattresses like the Arf Pets bed provide increased comfort and much more scope for contour and overall support of the body. A good, thick memory foam dog bed will generally cost quite a bit more than the thinner models. But the benefits are clear, so it all comes down to just how much support you think your dog both needs and will enjoy. The whole idea of memory foam is that it’s meant to never lose its shape over time. Cheap, low quality memory foam beds or pads will not stay in shape. Unfortunately, you only find this out some time down the track. This is why a quality bed is important, especially if the benefits of memory foam are important to you. As mentioned in many of the reviews above, most brands have available replacement covers that you can purchase seperately. Usually the cover simply zips on and off, making it easy to clean and replace when needed. It’s always good to keep at least one spare cover on hand so you won’t be left without if one is out of action for any reason (being washed, spoiled and so on). Usually these covers are reasonably priced and add only a small amount to the purchase price of the orthopedic bed itself.